will be a fundraising event (Bookfair) for Lane Library League. 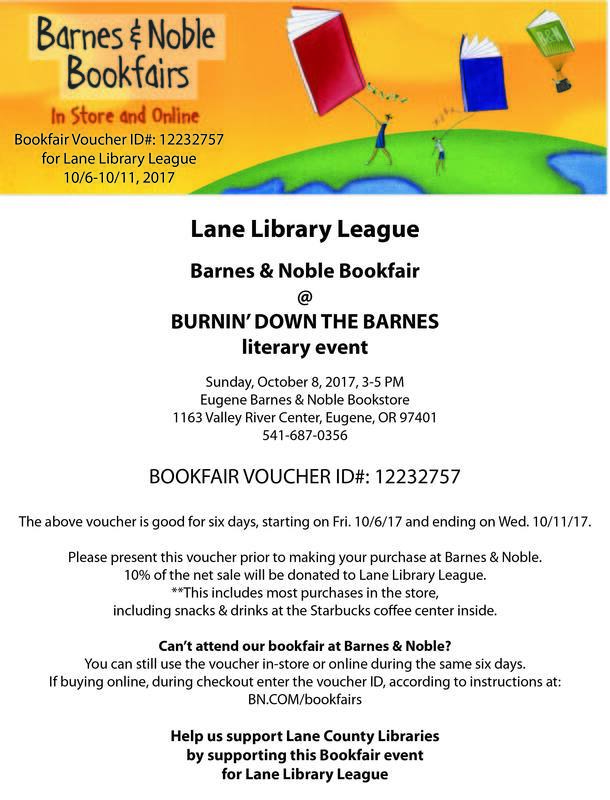 By using the voucher number below, with the Bookfair code number supplied by Barnes & Noble, your purchases will help to support Lane County Libraries. 10% of all proceeds will be given to Lane Library League. You can use the voucher FOR A FULL 6 DAYS!!! for almost anything that is purchased at the Eugene Barnes & Noble Bookstore or at B&N online. You can use it for the 6 days starting on Friday, Oct. 6th and ending on Wednesday, Oct. 11th. This includes drinks and snacks you buy at the Starbucks coffee lounge in the store during those Full 6 DAYS! and during our event.